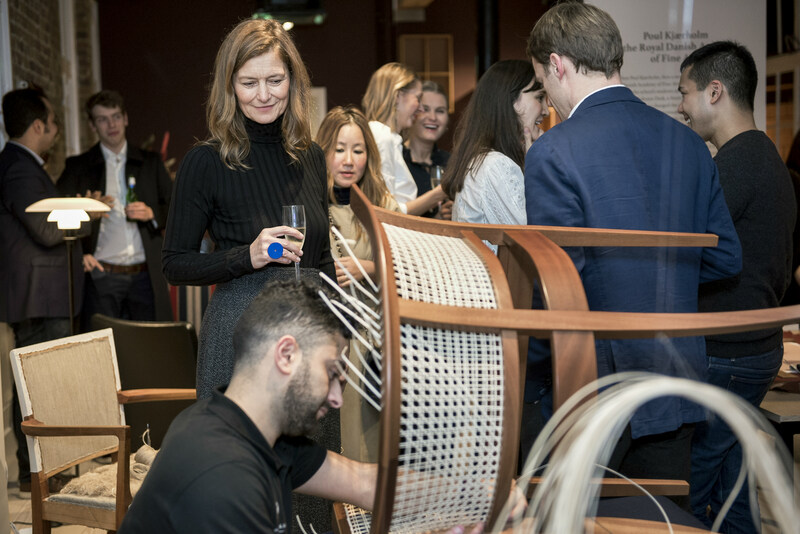 DesignCurial attended “The Story of Danish Modern Design Starts Here”: an exhibition and conversation on the living history of the Danish Modern furniture movement, taking place at Carl Hansen & Son's London showroom. 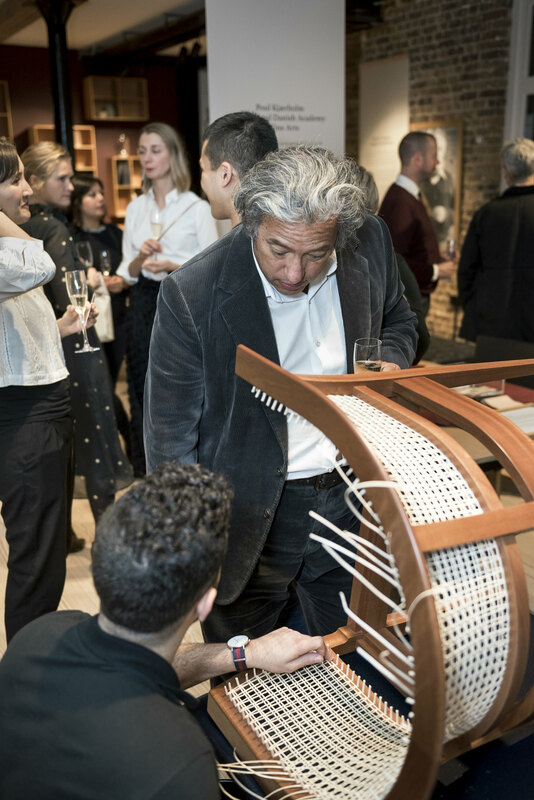 Champagne was flowing at Carl Hansen & Son’s London showroom on this week as a select group of architects, designers and furniture-lovers were invited to “The Story of Danish Modern Design Starts Here”, an exhibition and conversation on the living history of the Danish Modern furniture movement. 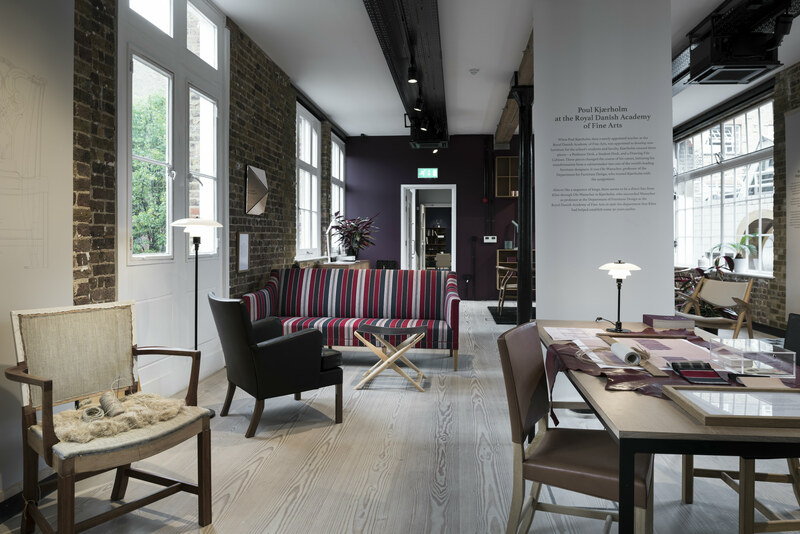 Taking place in Carl Hansen & Son’s Clerkenwell showroom until the 22nd December, and spread over the three floors of the contemporary space, the exhibition flows effortlessly through the history of Modern Danish design. Names of Golden Age Danish designers including Hans J Wegner, Mogens Koch and Poul Kjaerholm jump out at viewers from informative wall hangings, describing how they worked and interacted with each other. 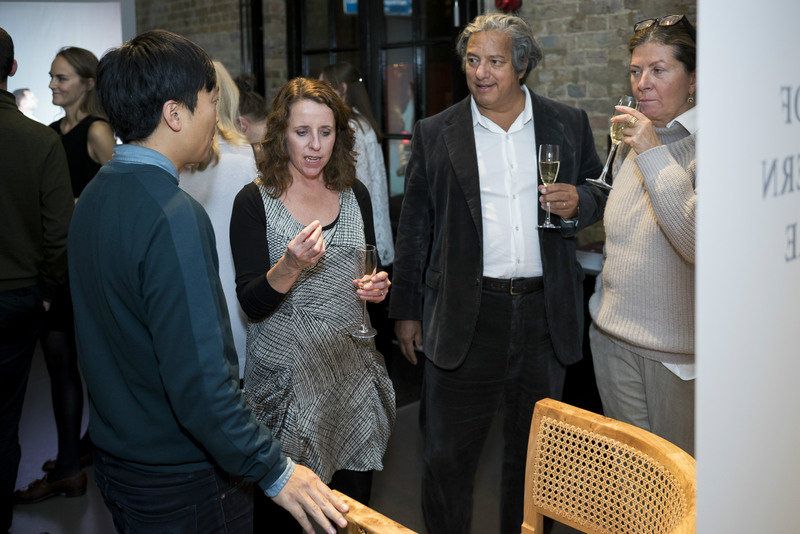 As guests entered the exhibition on the ground floor, they were greeted with a glass of champagne and several, perfectly poised editions of Kaare Klint’s iconic Faaborg Chair. Lined in a neat row, the chairs range from the elegant, original design to the incredibly special hundredth anniversary edition; there are only ten of these priceless commemorative pieces in the world, having been carved from an oak burl tree that previously stood on Rud Rasmussen’s property for a century. 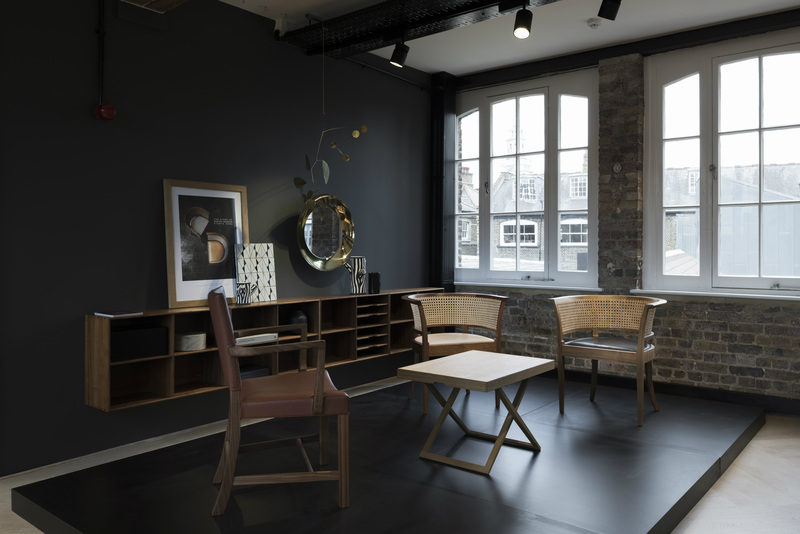 On the second floor, surrounded by yet more classic furniture – including Klint’s Safari Chair – sat a young man. Settled behind a desk, the man was patiently weaving; his concentrated gaze stayed fixed on the frame of another Faaborg chair as he skilfully pulled and knit the French canework onto the chair’s rounded backrest. Focused on his work, he was never distracted by the guests that watched in awe (having just been told that every Faaborg is weaved by hand, a process that can take up to twenty hours). Trays of petite canapés and bubbling champagne were forgotten as guests were ushered to the top floor of the showroom. This is what they had come for: an intimate talk, moderated by Johanna Agerman Ross, Curator of Twentieth Century and Contemporary Furniture at the Victoria & Albert Museum. 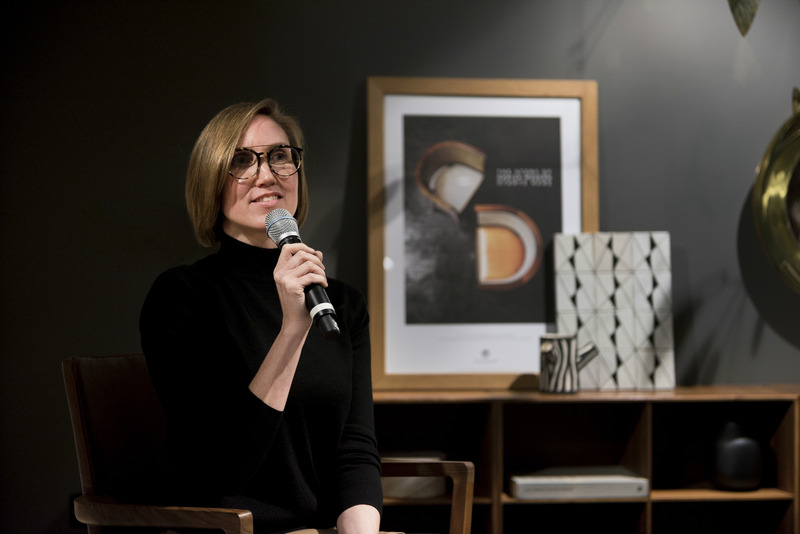 On the esteemed panel sat Anne-Louise Sommer, Director of Designmuseum Danmark, and current CEO of Carl Hansen & Son, Knud Erik Hansen – who is also the third generation of Carl Hansen & Son owners. Curiously, she noted that Klint is “unknown in many design circles because you always focus on the generation following him”, but his influence paved the way for these inventive designers. Klint was also an educator; in 1924 he helped establish the Department of Furniture Design at the Royal Danish Academy of Fine Arts. His teachings were “what the generations to follow would act upon”. Anne-Louise seemed to agree; “I see Kaare Klint as a bridging figure, who looked backwards and forwards.” When asked about Klint’s design technique, Anne-Louise mentioned that the style is “something that rests profoundly on the previous ages, but at the same time, [it is] something that points into the future… [Klint] looked at the previous generation’s chairs and he refined and simplified, with a strong focus on the traditional craftsmanship, the understanding of the material, the supple form”. To this day, focusing on the traditions whilst innovating and moving forward is something that seems to be second nature to Carl Hansen & Son. The Danish furniture design company boasts collections from many of the Golden Age Danish designers, which Knud Erik says is “a privilege”. 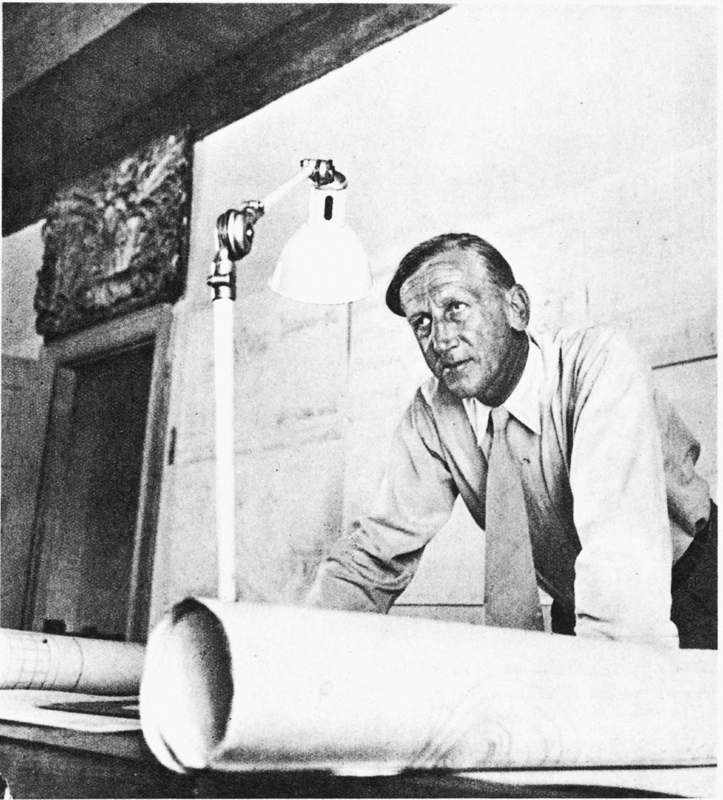 Whether working closely with Wegner, or taking up Kaare Klint’s designs, Knud Erik explained that for his company, work is all about “the families –the human beings who have worked with [the designers]… it is so rewarding when you are working [with them] every day”. Asked about future objectives for the business, Knud Erik only has one priority: “to get these two boys into the business”, he answered, meaning the fourth generation of Hansen sons. “I’m not pressuring them, but they really feel that this is their mission – they want to do it – and I am so happy”. With the talk reaching its natural conclusion, Anne-Louise, Knud Erik and Johanna re-joined the crowd to answer questions. 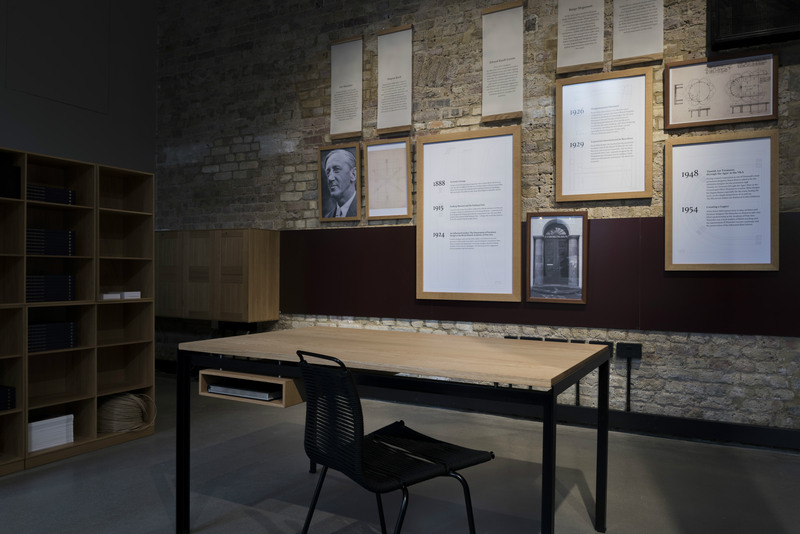 As guests began to disperse to explore the exhibition in greater detail, one thing remained certain in everyone’s mind: the past, present, and future of the Danish Modern furniture movement is definitely in safe hands.